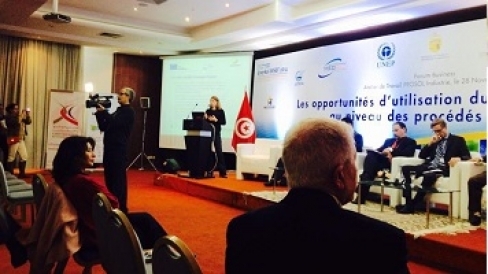 During the Expo-Conference EnerSol – World Sustainable Energy Forum 2014 held on November 26th, 27th and 28th, 2014 in Tunis (UTICA Headquarters), a MED-DESIRE round table was organised with the participation of ANME, institutions, cooperation agencies, banks and local financing experts active on renewable energy and energy efficiency in Tunisia. The roundtable was focused on how international cooperation actors and local banks can contribute to the promotion of distributed solar technologies in Tunisia. The objectives of MED-DESIRE project was presented by Mrs. Pansini, Financial Mechanisms Task Coordinator of the project, with a special focus on WP6 innovation financial schemes and market stimulations tools to spread energy efficiency and distributed solar energy technologies. Mr. Baccouche, MED-DESIRE project MANAGER, clarified the contribution of the project to spread distributed solar energy technologies in Tunisia through the establishment of an innovative financial scheme to promote Medium Size Solar Photovoltaic Systems, the capacity building actions and the strengthening of testing lab of solar thermal and PV systems, namely CTMCCV, CRTEn and CETIME.  The need to ensure the quality of solar equipments (solar thermal or PV) by the strengthening of the existing testing laboratories, namely CTMCCV or CETIME or CRTEn.